My daughter teaches me many things on an ongoing basis. I find myself looking at her every day and wondering where children get their wisdom, kindness and love from. Is it all innate and natural? Are we all born with this? Earlier this week, I was trying to prepare dinner and a child started howling in the corridor outside our home. The cry was a piercing, shrieking one, the kind that gets on your nerves and makes you want to cause serious damage! Just as I was about to step out and ask the kid to put a lid on it, Gy piped up in a soft voice, ‘Poor kid. I wonder why he’s crying. I guess he must be hungry or sleepy.’ The next second, she went back to reading her comic book. I, on the other hand, was standing frozen in the same spot. We talk about empathy and not judging another. We speak of walking in the other’s shoes. We try our best to understand where people are coming from. And yet, with all that practice, I still let a crying child bring out the sleeping dragon in me. But, a seven-year-old had the instinctive response of sympathy , without forethought. This got me thinking. So what happens then as we grow older? Do we lose that connection with the better part of our selves? Or do we just let Life and its anxieties overwhelm us to such an extent that we start suppressing our natural responses and react instead to external ‘irritations’? You have an argument with a relative/ your partner. He/she has criticised you over something, say, a dish you prepared with a lot of effort. In defense, you rise up, let loose some choice words and the ugliness hangs in the air for a long time. The mood is effectively spoilt and you have a raging headache and a mutinous glare to show for it too! This is because you REACT to the stimulus. So, wait. What if we were to RESPOND instead? The whole problem emerges from the fact that we take an insult personally. What if the criticism is aimed at the action instead of the person? When the criticism reaches you, pause for a second and think: Okay, she doesn’t like the dish. It’s not ME that she doesn’t like. Let’s take it from there. 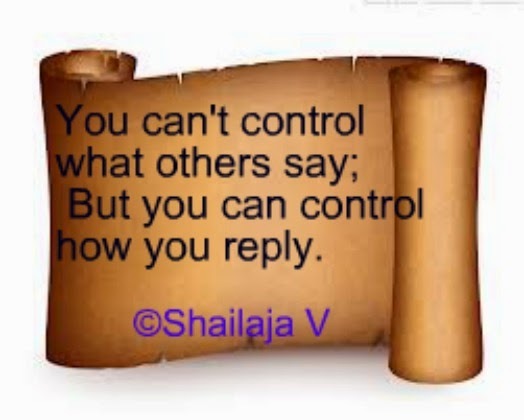 You cannot control what other people say, but you can control how you react to what they say. ‘Pause and respond‘ is an action that I have grown to love these days. It keeps me calm, lowers my defenses and makes me more open and receptive to people. Same scenario, different outcome. And a much better one, don’t you agree? This principle is one that can be applied across all relationships, whether it’s the parent-child dynamic, the spouses at loggerheads, the connection between friends or the bond between the sets of in-laws. As always, I believe we have a choice. We can choose to respond and not react. This will happen if we try and do it gradually, every step of the way and every moment of the day. It makes it even easier when we have children around to show us how to take those baby steps, one response at a time. I completely agree with you on this. If only we could pause to think and then react, life would have been much more simpler. I used to find this habit difficult to adapt though, till I was advised to take deep breaths before reacting in extreme situations, so as to calm the mind. And that really helped. Loved this one Shailaja.. thoughts that have been going through my head a lot in the last months too and why is that not even surprising any more 😉 ? Have a baby next door on the construction site that is constantly bawling at all times of the day or night, and my current thoughts extend to “Should I go see if that baby is being taken care of well?”. I loved this post.. I used to react first before.. but nowadays.. I listen and when the anger lessens, I talk or react. it does no good to shout and stomp about. This post is the perfect example of how we jump to conclusions. Children do teach so much. Great introspection! Deep post, Shailaja. Children are the best teachers, we can learn a lot from them. They look at life through clear and guileless eyes, we need to do the same. I think we let our worries suppress our true feelings and nature and we lash out at others. Thanks for the reminder, taking a deep breath helps in controlling outbursts, must try. Good post Shailaja. So true that if we responded instead of reacted, we would diffuse many highly charged situations. Children do teach us a lot and perhaps their simplicity comes from not analysing too much. I had this little post it stuck on my computer at work to remind me to take a deep breath and … respond intelligently to unintelligent treatment. A great question. I think as we grow older, we become hardened to others because of bad experiences. But we have to practice empathy to receive it. Gy is an amazingly perceptive and empathetic child Shailaja. As for the respond not react bit.. It's easier said than done. It often is an instinctive response. But reminders such as this one do help. This is excellent advice that I should heed more often. I tend to “fly off the handle” sometimes, without thinking things through, but then again, so does my other half. Keeps us on our toes, if nothing else. 😛 Your daughter is wise beyond her years! Kids can and do teach adults many things. The incident you described shows how kids 'think from the heart'. As the same kids grow up, many of them become judgemental, cynical, selfish, etc. to various extents depending on many factors like the atmosphere at home, school, etc..
We all know that “We can choose to respond and not react.” Yet, we often react instead of responding and then resolve to “respond and not react” the next time!! Great to be missed, Vinodini! Yes, that pause is so crucial, isn't it? Thanks for reading, as always! And then there was wisdom. Indeed, Hema. Makes no sense when a level-headed approach can do the trick. Even silence can work. You are a much better person than I am, haha. I have a lot to learn. yikes, this is me! I try pausing before responding, and it never works!! I think there is the whole element of stress that adds to it: trying to make dinner, clean up a mess, prepare for tomorrow etc when a kid decides to throw a tantrum and then the partner comes home and taste the dish you've been so overwhelmed making and makes a flippant comment. I get so mad just thinking about it!! hahahah I do need to meditate more though. Great article!! Indeed, if only we think a little before reacting, we can do away with lot of negativity.